Generation 4K. 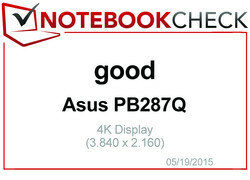 Notebookcheck tries something new and reviews the high-resolution 28-inch display Asus PB287Q. Read our review to find out whether the Ultra HD model is worth its price. 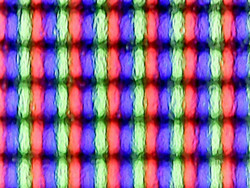 Displays with more than 22 up to 24-inches are getting more popular thanks to reduced costs and increased numbers of pixels. It was time for us to take a look at 4K as well. 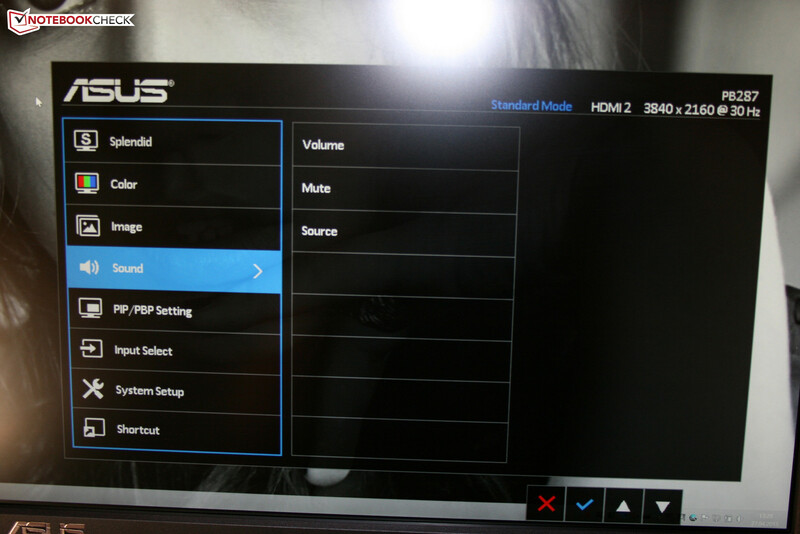 During our search for a suitable model for our gaming article (see GTA V, for example), Asus offered us a permanent test unit of the PB287Q. The 28-inch monster weighs eight kilograms and has the dimensions 66.0 x 41.4 x 22.0 cm with the stand. The screen ratio is unsurprisingly 16:9 and the display is available for around 440 Euros (~$489) in online shops. 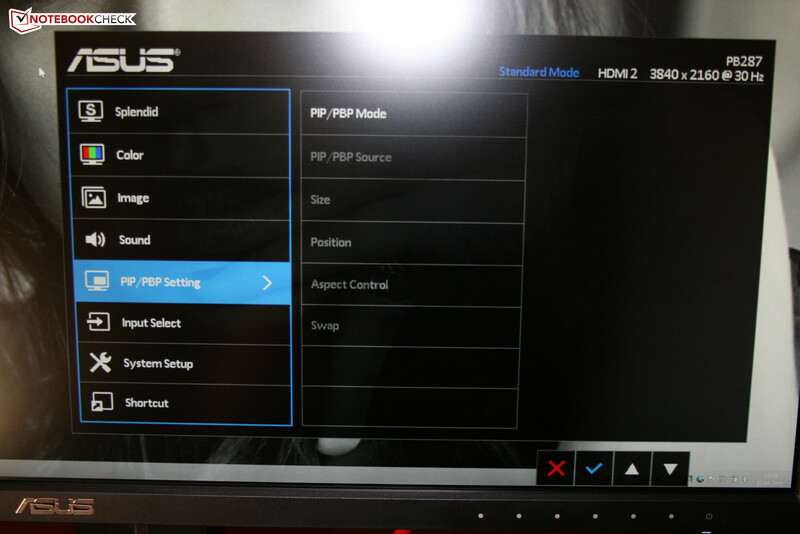 Asus decided against an IPS panel and in favor of a conventional TN panel to ensure the best gaming experience. 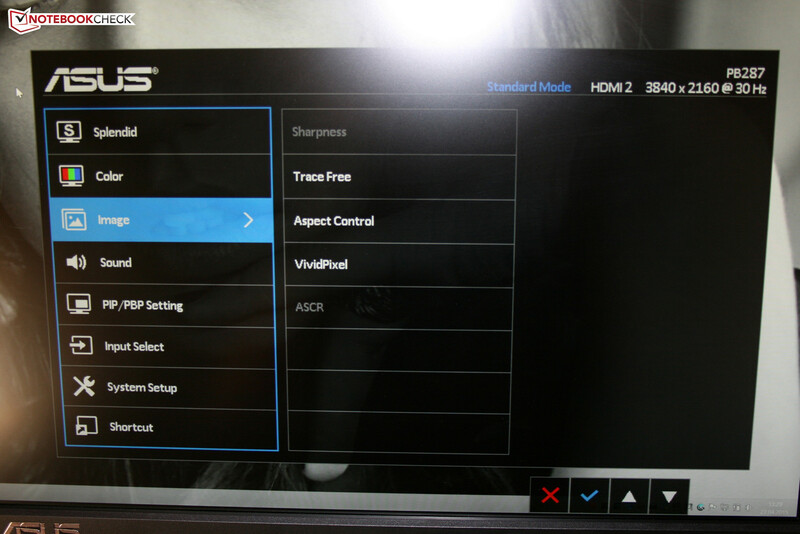 The latter technology does have better switching times (1 ms Gray to Gray according to Asus), but TN models can usually not keep up with the viewing-angle stability and color accuracy of an IPS panel. 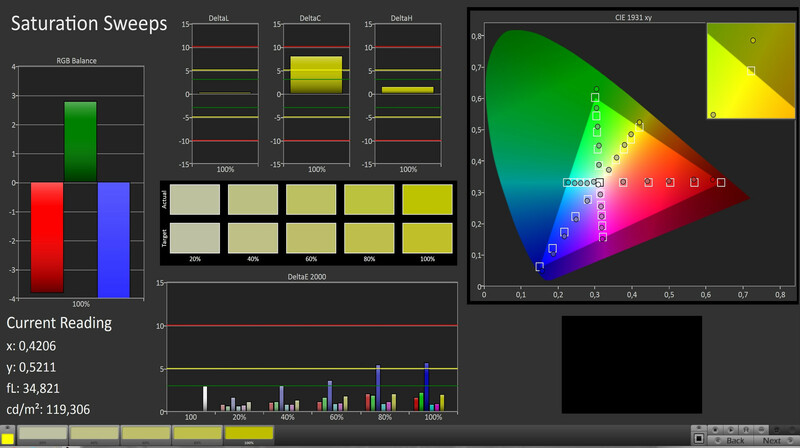 Another important specification is the color depth of 10 bits. The choice of a 28-inch display not only depends on the wallet and the expectations of potential buyers but also the available space. A diagonal screen size of 71.1 cm needs quite a lot of space on the desk. The chassis of the PB287Q does not leave an extremely good quality impression. Similar to the majority of companies, Asus mainly uses plastic, which benefits the weight, but it also affects the stability and the material impression. We think that Asus should at least have used a stand that is completely made of metal. The surfaces do not feel very sophisticated, either, and the dark colors quickly attract dirt. We would call the build quality decent. 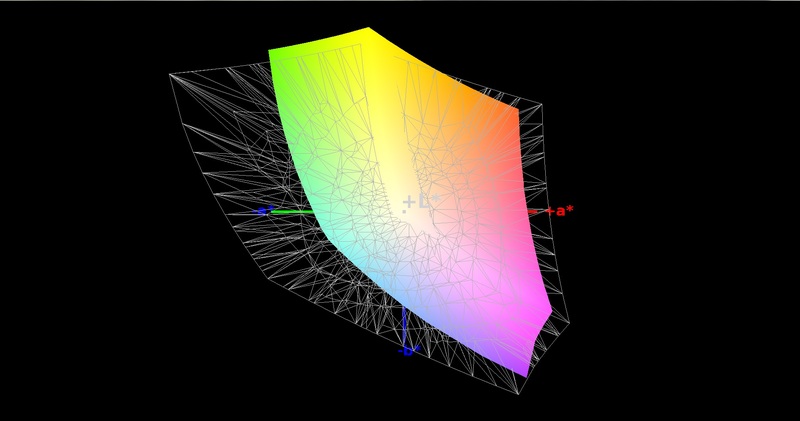 Almost all material transitions are clean. The manufacturer does not make any design experiments, and the general design of the PB287Q is pretty simple. If you ignore the missing webcam and the missing USB hub, then the connectivity is pretty good. 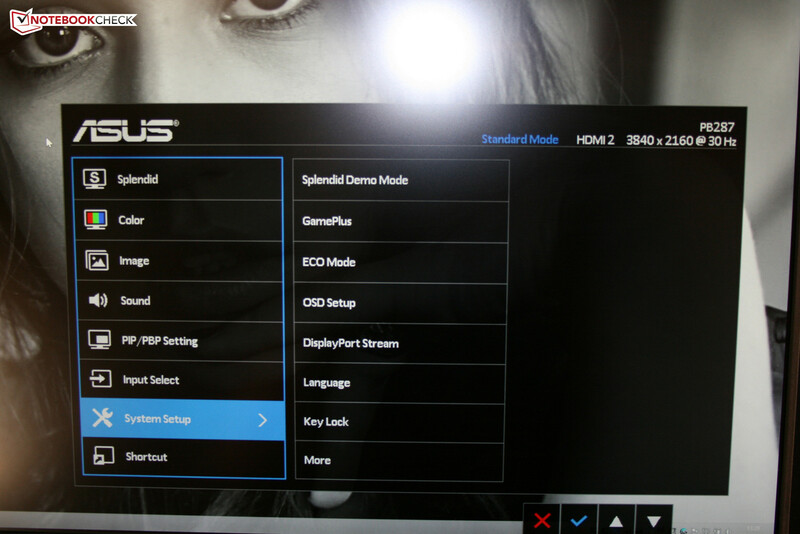 Asus equips the display with two HDMI 1.4 ports (1x MHL support) and a DisplayPort 1.2. Only the HDMI 2.0 standard supports a combination of 3840x2160 pixels and 60 Hz, so you are, unfortunately, limited to the DisplayPort for the 60 Hz/4K output. Attention: Besides the display, the cables and the video source (notebook, PC, etc.) have to support the DisplayPort 1.2 standard as well. 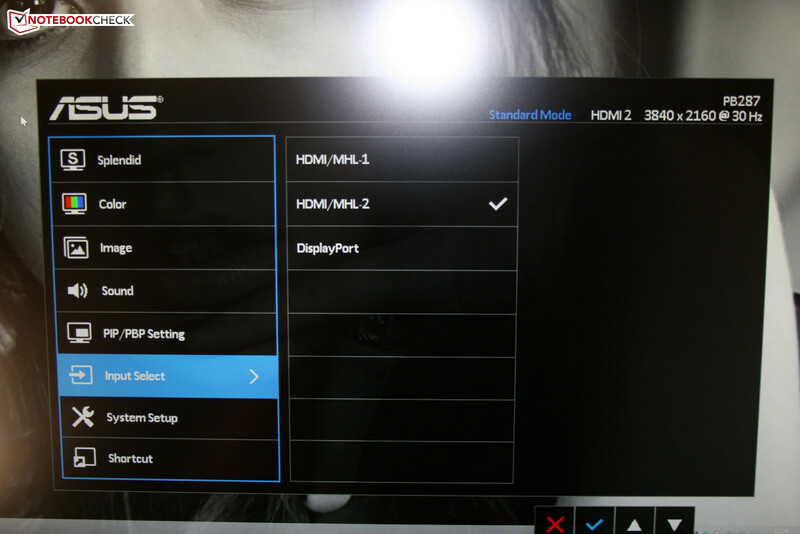 But even then you do not have direct access to the 60 Hz/4K combination. In the case of the PB287Q, more than 30 Hz only works if you change the option "DisplayPort Stream" from 1.1 to 1.2 in the menu "System Setup." Depending on the device you also have to adjust the video output. Our two test devices for our article "Gaming in 4K," the Schenker XMG A505 and Schenker W504, only delivered 60 Hz after we manually selected a higher frequency in the Intel driver. But back to the connectivity of the PB287Q. Besides the video ports, the 28-inch display also has a sound input and a headphone jack. Thanks to the integrated stereo speakers (2x 2 Watts) you can also use the display as a sound system. But the sound quality is, as expected, pretty bad and cannot compete with a dedicated sound system. 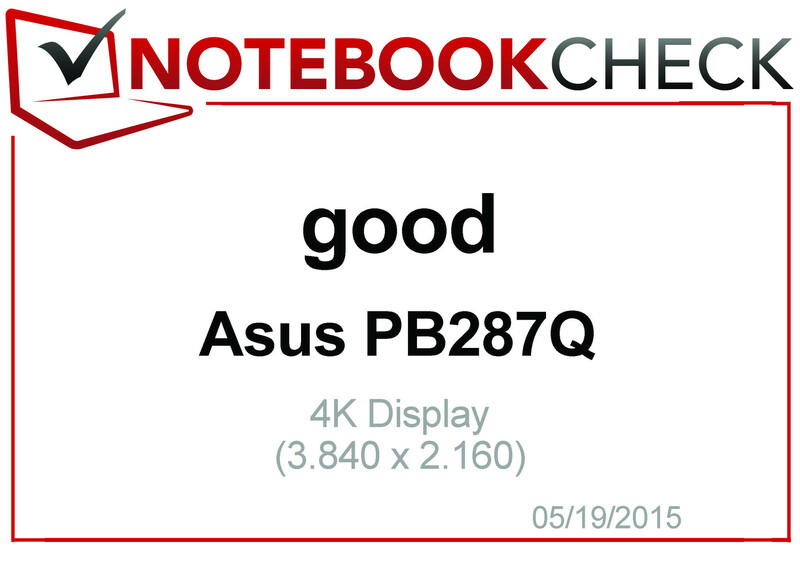 The PB287Q does, however, sound better than some notebooks. It is possible to secure the display via Kensington lock. The scope of delivery includes a quick-start guide, a warranty card, a power cable as well as an audio cable. The package is rounded off with an HDMI and DisplayPort cable. 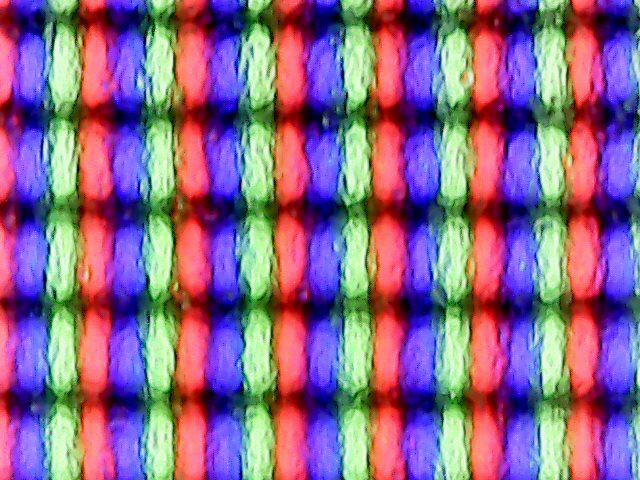 Note: If you can only drive the display via HDMI, but do not want to waive 60 Hz, you will probably be happy with the "Nvidia trick" (Chroma Subsampling, see here). The biggest advantage of the PB287Q is the excellent ergonomics. 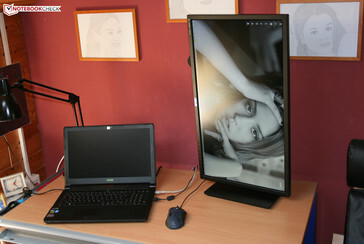 Contrary to many rivals, the 28-inch display not only can be turned or tilted, but the height can be adjusted as well. The latter function makes it really easy to create the perfect working environment. 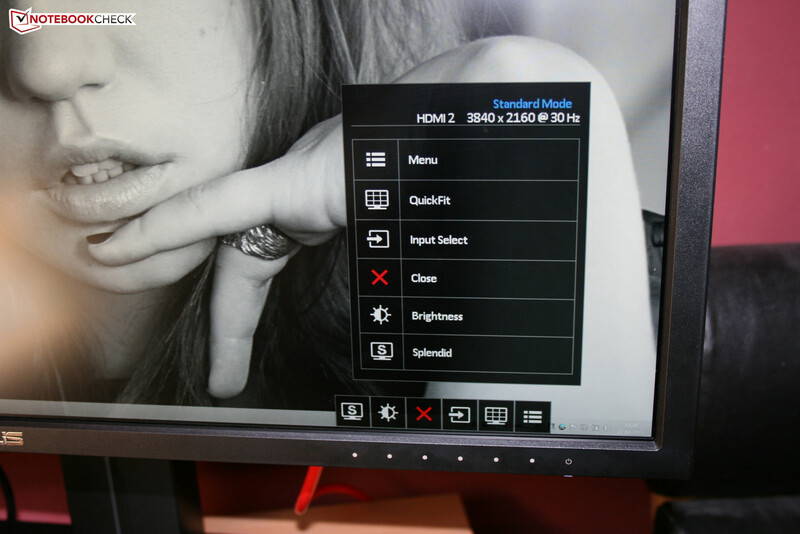 If you need a lot of vertical space you can also use the PB287Q in portrait mode (Pivot). A wall mount according to the VESA standard 100 x 100 (not provided) is possible as well. It cannot get much better. We were actually pretty disappointed about the handling. Because the power button and the six menu buttons are located at the back of the device and there are no symbols at the front (except for power), you pretty much have to control the PB287Q blindly, which results in many wrong inputs. It often happened that we hit the "Off" button instead of the main menu, for example, or pushed "Cancel" instead of "Accept." The handling of the PB287Q takes a lot of time getting used to, even when you use multiple fingers at the same time. 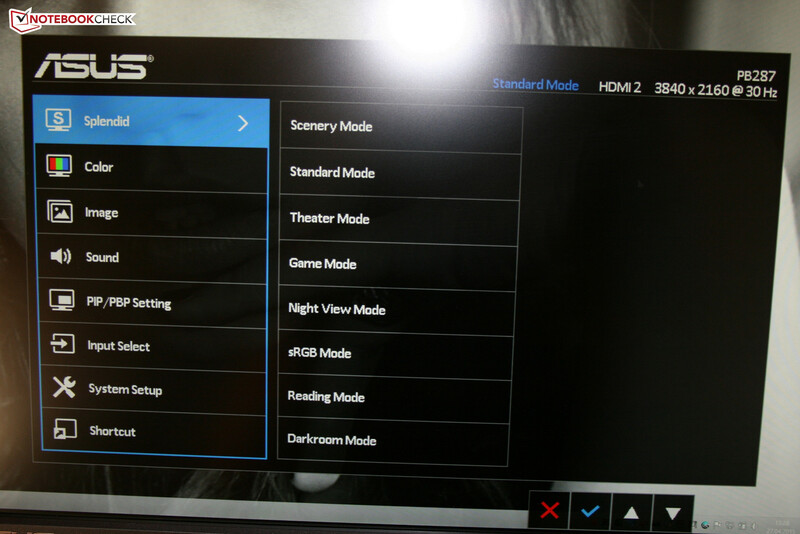 The different menus can at least convince us with the large number of options (brightness, contrast, color temperature, aspect ratio, picture-in-picture, gaming optimizations, eco mode, and many more). The so called Splendid technology probably has the biggest effect on the picture. 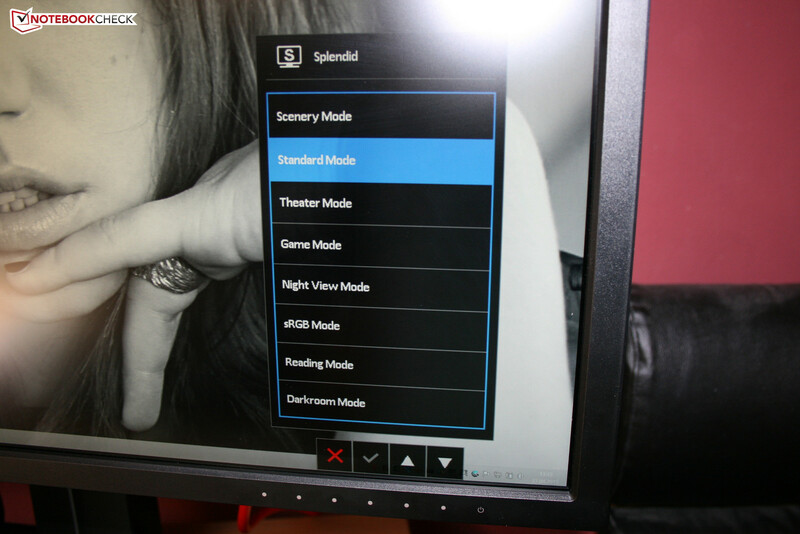 The corresponding menu offers eight different modes for the user, including modes like "Theater," "Game" or "Night View," so you can comfortably adjust the display to the current situation. Similar to our notebook reviews, we used the X-Rite i1 Basic Pro2 in combination with the i1-Profiler (brightness, calibration, color space) and the professional software CalMAN (black value, grayscale, RGB balance, color saturation, color accuracy) for our measurements. 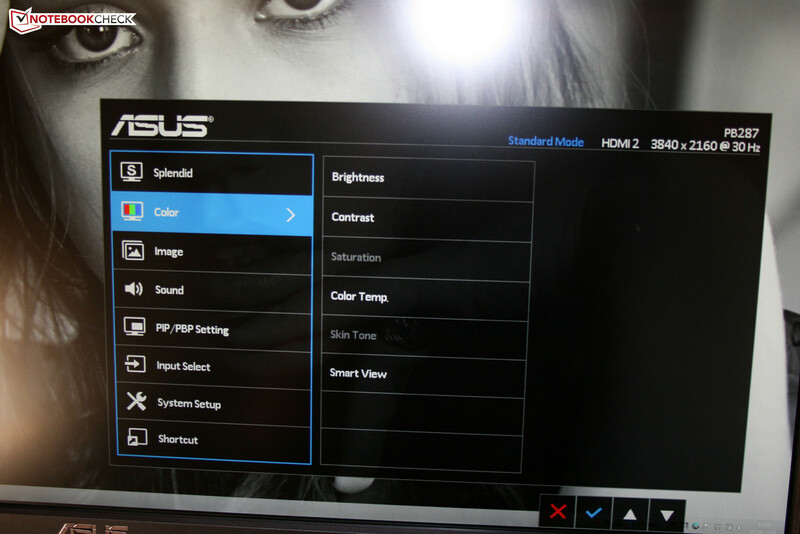 Result: We cannot confirm the advertised 300 cd/m² from Asus, but up to 267 cd/m² at the maximum brightness setting is more than sufficient for indoors. 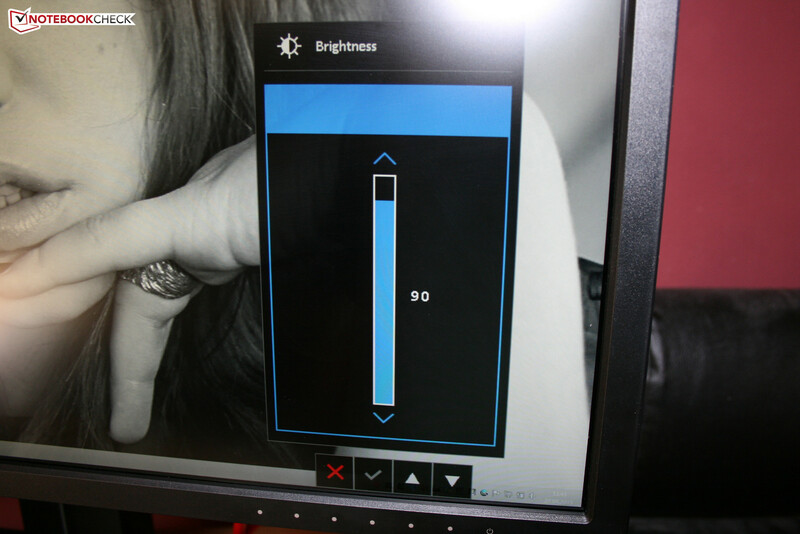 Ex-works (90% brightness, 80% contrast), the luminance of the test display was between 201 and 243 cd/m², which is a usable value for many scenarios. The black value is decent as well at 0.28 cd/m², so darker gaming and movie passages only have a slight gray hue. 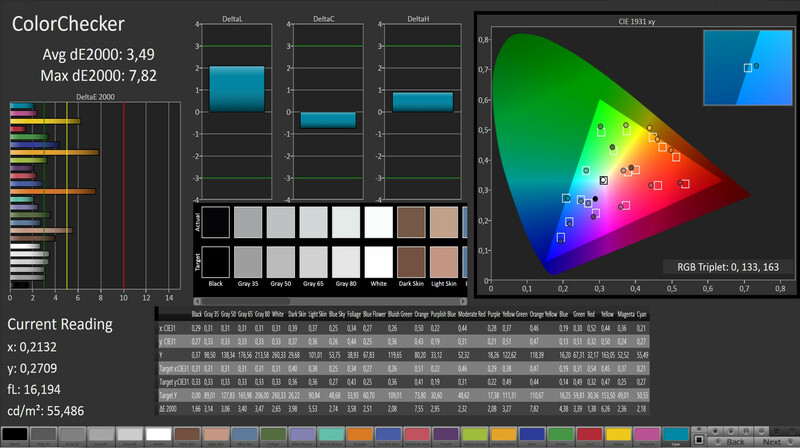 The brightness and the black value result in a contrast ratio of almost 870:1 for the PB287Q - a good result, but it is beaten by some (notebook) displays. The majority of users should be satisfied with the picture quality. Pictures, videos and games look very rich and differentiated, despite the matte display surface, which reduces reflections. 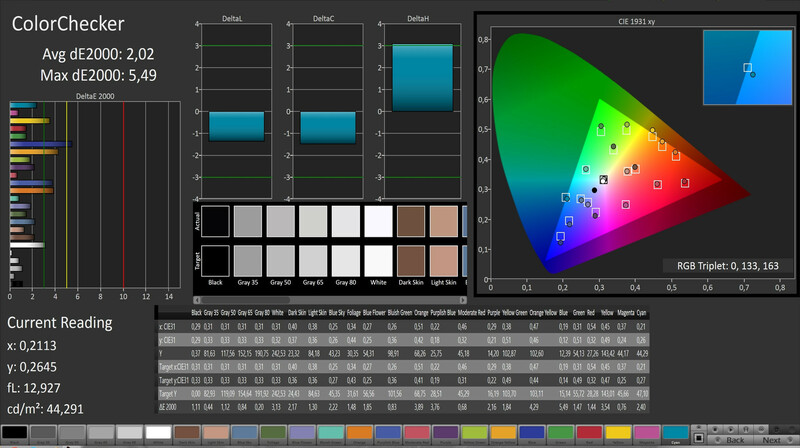 The integrated ACI28A3 (display ID) has pretty neutral colors for a TN panel. The picture appears much more natural and balanced compared to notebook versions like the Chi Mei N173HGE-L11 (One K73-5N) in particular. One reason is the decent color balance, which does not show a visible blue cast or the like. 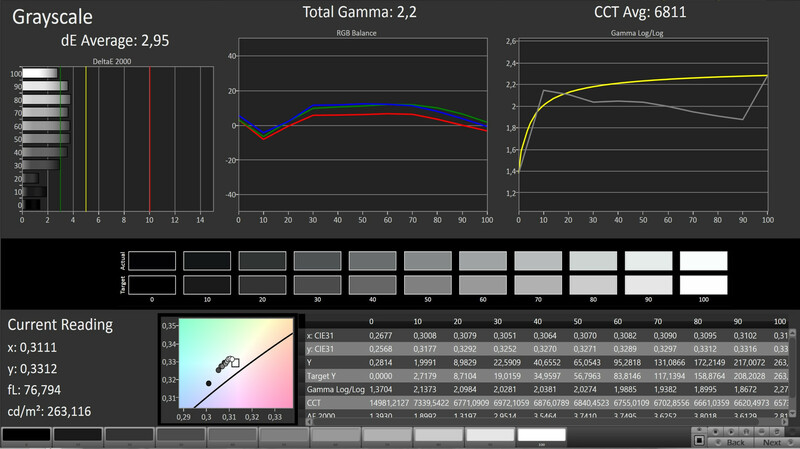 A gamma value of 6,811 and an average DeltaE2000 value of 2.95 (grayscale) and 3.49 (ColorChecker), respectively, are not bad for an uncalibrated TN panel, either. We obviously checked the color-space coverage as well. 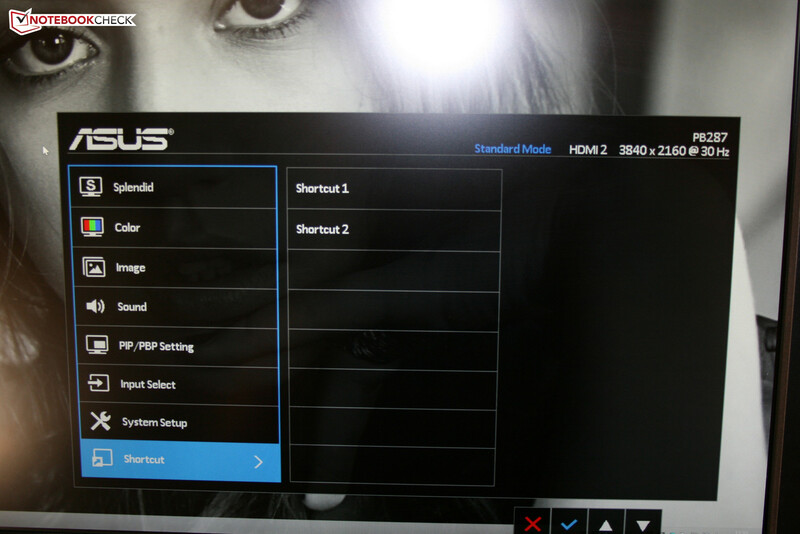 Asus squeezes a lot out of the technology with 93% sRGB and 60% AdobeRGB. The results are more than okay when you are not a professional user with extremely high expectations. The only criticism concerns the average brightness distribution. 83% suggests an uneven picture, and we can actually see screen bleeding on a dark background, but the affected area is pretty small. At least the horizontal viewing angles do not have to hide, and the panel also handles shifted viewing positions pretty well. As is typical for a TN panel, there are bigger deviations with vertical shifts (especially from below), but the P287Q is still better than three-quarters of the notebook displays. We measure the power consumption at the socket with the Voltcraft VC 940. 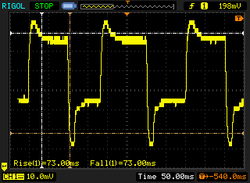 While the PB287Q consumes 0.1 Watts when it is turned off, it needs 0.1 Watts in standby as well. 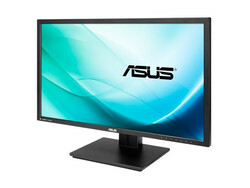 A running display consumes around 40 Watts (Windows Desktop with wallpaper). We have no comparison results, so there is no rating in this category. The Asus PB287Q is a good and not too expensive 28-inch display. We think it is a bit unfortunate that the manufacturer does not use an IPS panel, but the TN panel actually works pretty well from a gaming perspective (short reaction times). Whether a 4K model is really worth the money basically depends on the user. Corresponding displays are not a "must have" in 2015, but more of a "nice to have." The main issue is still the enormous performance requirements. Notebook GPUs in particular have problems with the frame rates in complex titles. Even high-end chips like the GeForce GTX 980M or GTX 970M quickly drop below 30 fps in higher settings. This is, however, not surprising when you consider that the amount of pixels is increased by the factor 4 when you increase the resolution from 1920x1080 to 3840x2160 (8 vs. 2 million pixels). The display at least does not have to interpolate Full HD when you have performance problems, since four pixels exactly result in one (important for the image sharpness). 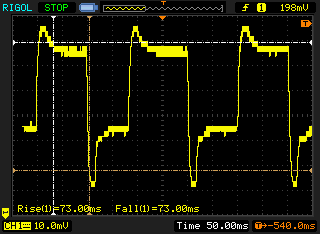 Another important feature is that the backlight is not using PWM at reduced brightness. Even in the lowest brightness setting we were able to record a constant brightness reading without modulation.